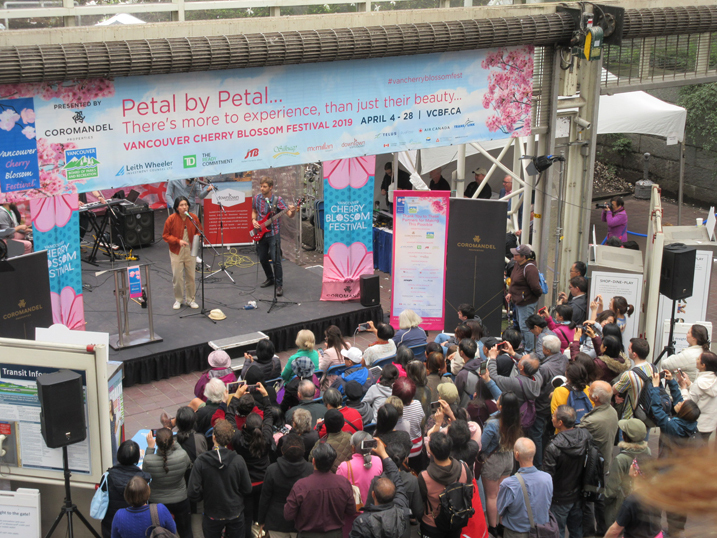 The Vancouver Cherry Blossom Festival kicked off today with Cherry Jam, a noon-hour concert at downtown’s Burrard SkyTrain station featuring memorable performances. After a word from the festival’s creative director Linda Poole, Zimbamoto took the stage with contemporary African music. Katari Taiko featured a battle of taiko drums. Sporting pink socks, the newest member of the festival’s executive team presented the Ornamental Cherries in Vancouver and introduced the next performers, NoriNori. The duo performed an energetic rendition of Sakura Sakura on the shamisen and taiko. MNGWA surprised the audience by starting with a very lively adaptation of The Simpsons TV show. On the concourse, vendors were providing information and tea samples. And, of course, the blossoms were there. The green leaves had started to come out, which means the petals were falling gently on the crowd who was gathered to admire the blossoms. 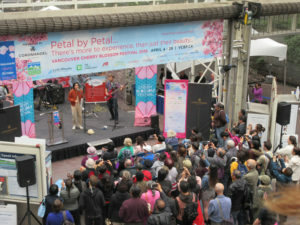 This was a perfect beginning, considering the the theme of this year’s festival is ‘Petal by Petal’. Check the festival’s community events page which list tons of activities to enjoy the blossoms such as a Big Picnic, Sakura Days Japan Fair, Bike the Blossoms, a haiku contest, and more!